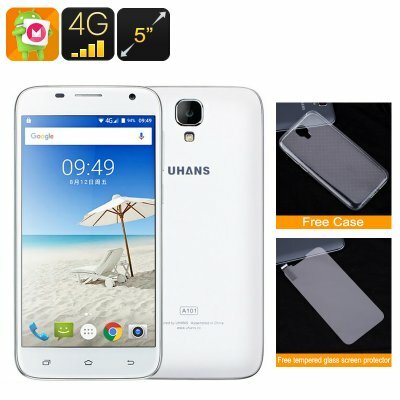 Successfully Added UHANS A101 Android Smartphone - Android 6.0, Quad-Core CPU, 4G, Gesture Sensing, 5 Inch HD Display, Dual-SIM, Dual-IMEI (White) to your Shopping Cart. With its astounding rounded design that features neither sharp lines nor right angles the UHANS A101 Smartphone brings out some true beauty. Its 5 inch HD display has been placed in a well-crafted body made out of eco-friendly plastic materials that has been sprayed with a metal paint coating, creating an astonishingly sleek and stylish looking smarpthone. Along with its Android 6 operating system this Android phone is guaranteed to satisfy you with an exceptionally smooth user experience. With 4G connectivity this Chinese smartphone lets you enjoy the fastest mobile data speeds out there. Browse the web smoothly without encountering any lag and interruptions no matter where you’re headed. With this phone you will always have the means to stay connected with your friends and loved ones. Installed on the UHANS A101 you will find Google Play that allows you to instantly download millions free mobile applications, games, movies, and more onto your smartphone. Enjoy your favorite movies and series from the palm of your hand on a 5 inch HD display or discover the latest mobile games – with this Android device at hand there will be no need to feel bored again anytime soon. Featuring a Quad-Core CPU that has been clocked at 1.3GHz and 1GB of ROM the UHANS A101 Android smartphone is capable of handling all your everyday demands. Whether you like to watch a movie, play games, browse the web, or enjoy the latest Apps – with this Android phone your options are limitless. Throw in an additional 64GB of external data and you can be assured that you have enough storage space to save and carry around all your mobile files and entertainment anywhere you go. Dual-SIM card slots allow you to insert two SIMs that, thanks to the phone’s Dual-IMEI, can both be active at the same time. From now on you will be reachable on two different phone numbers at any time of the day by using just one device, providing you with the perfect phone to separate business and private life. Gesture sensing technology allows you to navigate through your smartphone by simply hovering your fingers closely above your touch screen without the need to actually touch the display. For those who still like to physically touch the display while browsing through your apps and pictures this 5 Inch smartphone features an anti-fingerprint display – ensuring that greasy fingerprints will no longer stain your smartphone. The the UHANS A101 Smartphone comes with a 12 months warranty, brought to you by the leader in Android phones as well as wholesale electronic gadgets..
Arabic: - 5 بوصة الروبوت الذكي - Chinese Simplified: - 5 英寸的 Android 智能手机 - Czech: - 5 palců Android Smartphone - Dutch: - 5 inch Android-Smartphone - French: - 5 pouces Android Smartphone - German: - 5-Zoll-Android-Smartphone - Hebrew: - הטלפון החכם אנדרואיד 5 אינץ ' - Hindi: - 5 इंच एंड्रॉयड स्मार्टफोन - Hungarian: - 5 hüvelykes Android okostelefon - Italian: - Smartphone Android da 5 pollici - Japanese: - 5 インチの Android スマート フォン - Korean: - 5 인치 안 드 로이드 스마트폰 - Malay: - Telefon pintar Android 5 inci - Norwegian Bokmål: - 5 tommers Android Smartphone - Romanian: - Un Smartphone Android de 5 inch - Russian: - 5-дюймовый Android смартфон - Spanish: - Smartphone Android 5 pulgadas - Thai: - สมาร์ทโฟน 5 นิ้ว - Turkish: - 5 inç Android Smartphone - Vietnamese: - 5 Inch Android Smartphone.